In preparation for the exhibit proposal presentation, the following description of work was mailed to the Adler Display company in Baltimore, Maryland. This company was selected from a total of three vendors that had shown some interest in contracting this work. Description of work: To display a collection of personal and government documents, photos and various artifacts associated with the United States Air Force and the Vietnam era airborne radio direction finding (ARDF) program. 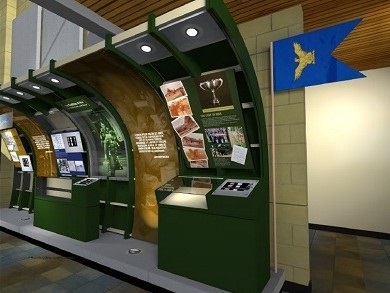 The display will be constructed at Goodfellow Air Force Base, San Angelo, Texas. The display area has been approved and reserved for this specific project. 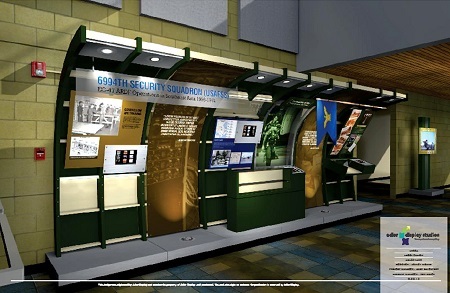 The approximately 20-foot long display wall is inside the 17th Training Wing Headquarters building near the exterior doors that open to the large EC-47Q (DC-3) static display. The linked documents track the progression of the project through design concept, contracting, and installation.